Everyone has won leagues with a superstar Quarterback. The rule of thumb is to always wait on QB, I agree. I also know that Fantasy Sports Central won our last 2 high stakes FFPC Main Event leagues while drafting one of the top 2 QB’s off the board (Manning in ’13 and Rodgers in ’14). In the high stakes events we see that the Quarterback actually goes later than most home drafts and is actually undervalued. We drafted both of those 2 in the 3rd round while they went in the 1st and early 2nd in most of our home leagues. At some point the value outweighs the strategy. At FSC we think outside of the box. Our projections will rank players based on opportunity while excluding hype. Always avoid the hype train. When your league zigs, you need to stick with the rankings. When there is a Wide Receiver run it pays to stick with the rankings. You should always, however, be mindful of the player grouping at the position you are looking at drafting. QB’s for example: would I love to have Rodgers or Luck? Of course. Do I draft them in the first round? Never. Do I ignore them in the third round. Never. Russell Wilson is our early ranked 3rd QB off the board based on our projections. His opportunity has accelerated with the addition of Jimmy Graham and the late showing of big target Chris Matthews. His ranking is justified as he has been one of the most consistent QB’s in fantasy the last 3 years. He had 30-27-26 total TD’s the last 3 years. We have him at a total of 30.5. Again, let’s talk value. Wilson’s’ ADP has him going somewhere in the middle of the 3rd round. Matthew Stafford is projected for 27.2 total TD’s and he has a price tag of the 11th round. That is a monumental difference from Wilson. Remember the 2011 reference, oh yeah, Stafford had 41 passing TD’s and 5100 yards that year. I am not saying that he is going to do it again, I am simply saying that he has done it before. When I look for value I usually don’t point to the break-out candidate, rather I point to the guy who has a track record. Especially when there is an 8 round difference. That is a gamble that these Vegas’ guys will always take. In terms of projected fantasy points we have 12 QB’s knotted up between 320-280 points, while Luck and Rodgers are projected at 370 and 350 respectively. If Luck and Rodgers fall to me at the end of round 2 or later I grab them, if not, I wait on QB. The next tier: Russell Wilson, Peyton Manning and Drew Brees will most likely not land on my teams because I will not give them a round 3-5 pick. Round 6, now we are getting into the value zone. I will most likely be drafting Eli Manning, Matt Stafford, and Tony Romo in rounds 9 through 11. While everyone is searching for the next shiny new toy at WR and RB don’t forget to find value in the forgotten 2nd and 3rd year players. The fantasy masses always want to be the one that finds the new up and coming guy. “I drafted ODB as my 6th WR and completely dominated my league.” Good luck with that strategy in your 2015 season. The NFL offensive playbooks are very complicated. The college game is much slower with less-than-professional competition sometimes on the field. A rookie coming in has to learn the plays, the play calling, off the field adjustments, first big payday in life (hopefully), and we haven’t even stepped on the field yet. Timing, timing, and timing through repetition is the key to winning the trust of an Offensive Coordinator and Quarterback. That said, after a quiet rookie or 2nd year season players often go over looked. 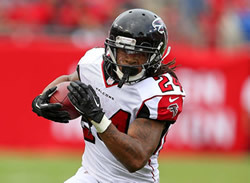 Is Tevin Coleman (Current ADP 6th round) a better value than Devonte Freeman (Current ADP 8th round)? Or is Ameer Abdullah (9th round) going to produce more than Theo Riddick ( 17th round). Obviously it is May and this is all contingent on who gets the playing time, but the point is that the early consensus always favors the unknown over incumbent. The question is why? Theo and Devonta both had decent seasons, why is it that we are drawn to the unknown? A lot of coaches are signing up for the logic of having bullpens of talented key offensive players. Have you looked at the Colts WR core? TY, Andre, Donte Montcrief then they still draft Phillip Dorsett in the first round. Tre Mason looked like he was going to be the next bell cow for Coach Fisher (and still might), but the fantasy world was shocked when they took Todd Gurley, the best RB in years with their first selection. Breshad Perriman is going in the 12th round while Marlon Brown is going in the 20th. Remember Marlon broke out in 2013 and then regressed in 2014. The point, I’m getting there, teams are stacking up for competitive psychology, additional support, and more. Injuries, unforeseen issues, and slow starts make up the need for teams to bulk up the bench. This is an offensive league. Every Offensive Coordinator is adopting the committee approach to keep players fresh and in rotation. Teams are also now better prepared for the “next man up” scenario. True some of these players will turn out to be fantasy busts. The draft is an art that is won by the person that finds the most value with every round. Just glancing at the two lists the rookie list looks a lot more exciting because they are new, but the 2nd list will likely outscore the rookie list. That is with an ADP above of 7.6 for the rookies and 11.8 for the 2nd and 3rd year guys. You will rarely find value drafting a rookie in Re-Draft Leagues.